This is an example of what you might have for breakfast on your all-inclusive, Caribbean yacht charter. Whisk together coconut milk, Coco Lopez, heavy cream and eggs in mixing bowl. Soak each slice of bread in the mixture. Cook slices on a griddle or pan until each side is lightly browned. Finish cooking in the oven (depending on the thickness of the bread). 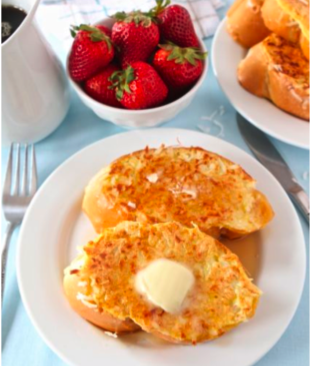 Serve hot with butter and optional warm maple syrup. 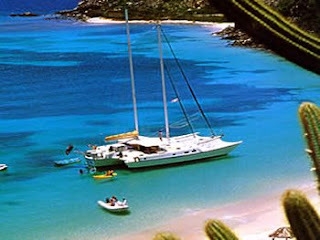 The Caribbean yacht charter season is about to start up again... Time flies! We still have some openings for Christmas 2013 but not many for New Years. We still have good availability for other weeks of the season so don't wait too long. Get together with your family and friends and start planning your sailing vacation. A crewed charter yacht vacation has so much to offer. Choose your itinerary, pick your activities, set your own pace and even change your mind (attitude with latitude adjustment at no extra charge). Please check out this blog and look around our web site. Read our various online brochures to get ideas, then call or send us an email so we can help match your needs with the yacht best suited for you. We want you to enjoy our islands and return again soon. This yacht is no longer available for charter. 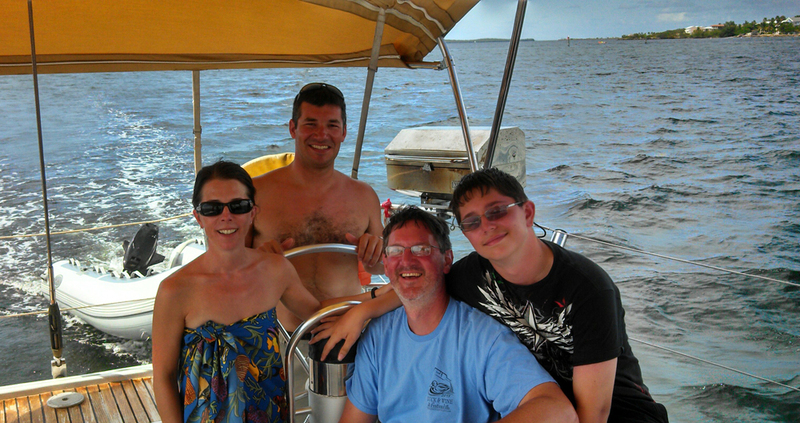 Jaimey and Jack on BLUE MOON, a 56-foot Lagoon catamaran, are offering up two great specials. 5% discount on all family charters (except Christmas and New Years holiday weeks) with children under age 16. Offer not to be combined with any other special offer. 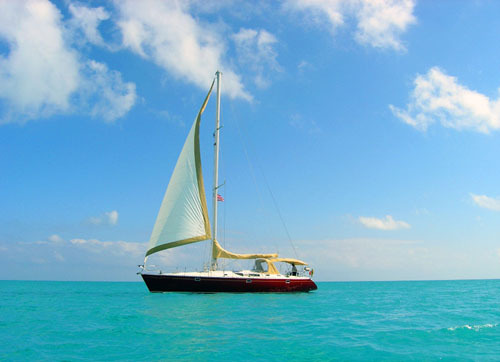 Blue Moon is a 56-foot Lagoon catamaran with a crew of two. Blue Moon has a flybridge and is fully air conditioned. 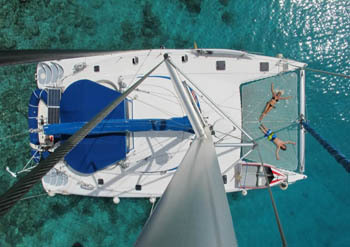 The catamaran accommodates up to 6 guests in 3 cabins with Queen berths and ensuite head/shower. Blue Moon has a 13-foot center-console dinghy with 60HP motor, tube, kneeboard, wakeboard, 2-person kayak, standup paddleboard (SUP), snorkel gear, fishing rod, hammock, satellite TV/DVD in salon, underwater camera, etc. The Sail Dive Charter Yacht Promenade has scheduled a cabin cruise week in February 2014. This is the only charter-by-the-cabin week that Promenade has scheduled for 2014. They are very popular so don't delay... Contact us ASAP. One thing cool about this year's cabin charter week is that you have your choice of booking either SEVEN or TEN nights aboard, plus a FREE sleepaboard if you wish. Saturday, February 15: Complimentary sleep over if desired. Boarding after 4 PM, in Roadtown, Tortola. No services included (ie, dinner that night and breakfast the next morning on shore). Includes: All meals aboard and ship's standard bar, cruising taxes, port taxes, overnight air conditioning and all onboard ship's toys. 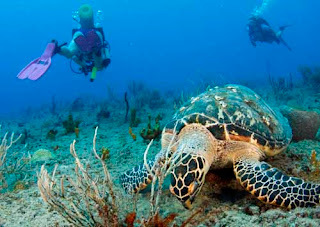 SCUBA diving is also included for CERTIFIED divers on a casual basis (one dive/day). Excludes: Transportation to and from the yacht, including plane and taxi fares. Crew gratuities which are at your discretion but typically 15% of charter fee. Any meals and beverages you choose to have on shore. You will be responsible for one dinner ashore on the ten-night package only. BC and Regulator rental for scuba diving, if needed, is available at $125/diver for the charter period. Please note that this is a NON-SMOKING week. No cigarettes, no cigars, no pipes to be smoked while on the boat. If this is of interest, don't wait... We are actively trying to book her up and it would be a shame for you to miss this once-a-season opportunity for 2014. Ask us about Promenade's special pricing for Thanksgiving & Christmas! Honiara is a 45-foot Beneteau sloop. Owned and operated by a Canadian couple, Pierre Boudreau & Adele Pare. Pierre is the captain, and also a CYA sailing instructor, and Adele is the first mate/hostess. Both are excellent chefs! Honiara accommodates up to 4 guests in 2 cabins. A two-person charter has their choice of the forward cabin or an aft cabin. For a two cabin charter, the guest cabins are aft and each have double berths with ensuite head/showers. While not air conditioned, they do have fans. Honiara has a 12-foot dinghy with 25HP motor, 2-person kayak, snorkel equipment, hammock, noodles, and a DVD player in the salon, iPod sound system, internet access where available. - BROCHURE: Click Here to Inquire. New entry into charter fleet so no brochure yet. 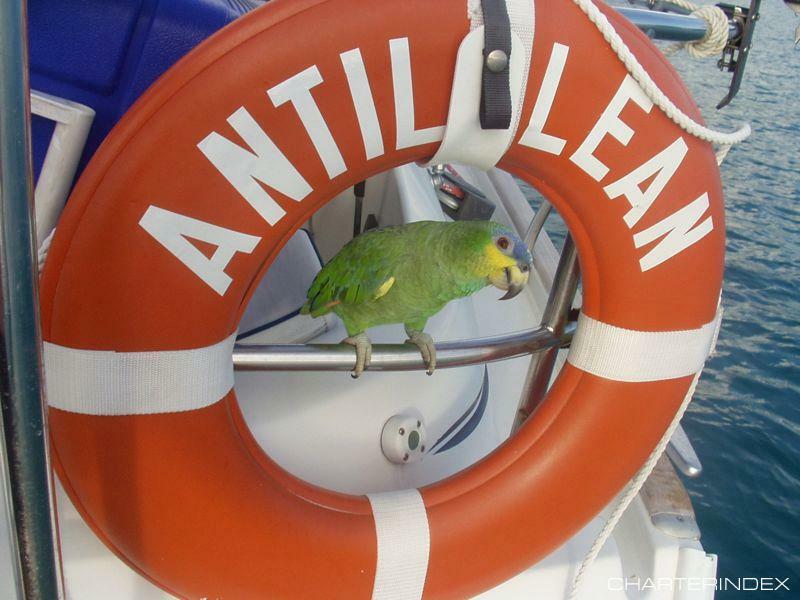 Antillean is an owner-operated 50-foot Beneteau sloop. John Gould (British) is captain and Heidi Wheeler (American) is the chef/mate. Mr. Smee is the ship's parrot. 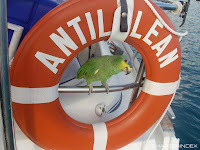 We were on board Antillean for about an hour at a recent yacht show and I was impressed by how well behaved Mr.Smee was. Antillean accommodates up to six guests in three cabins (2 Queens, 1 Double) each with ensuite heads/showers. They have a 14-foot center console dinghy with 40HP motor, 2-person inflatable kayak, standup paddle board (SUP), fishing gear, snorkelling equipment, 20" Flat screen TV with DVD in the salon, floating mats, noodles, hammock, etc. Internet where available. - NEW YEARS: Booked beginning Dec 28. Bella Vita is a 46-foot Leopard catamaran with a crew of two. 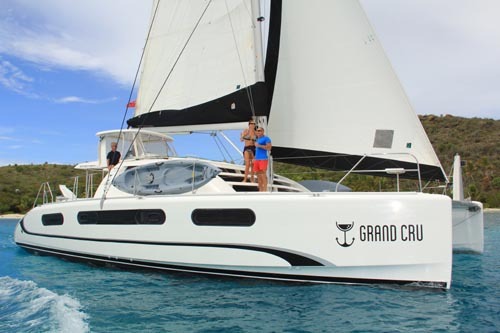 This catamaran is fully air conditioned and accommodates up to 6 guests in 3 cabins with Queen berths and ensuite head/shower. Bella Vita has a 16-foot dinghy with 80HP motor, waterskis, tube, kneeboard, 2-person kayak, snorkel gear, fishing equipment, underwater camera, TV/DVD in salon, internet where available, etc. Milagro is a 46-foot Fontaine Pajot catamaran with a French crew of two, Cécile and Arnau (very interesting crew profile!). Milagro accommodates up to 6 guests in three cabins, each with ensuite head/shower. Milagro has a 12-foot dinghy with 9HP motor, 2 two-person kayaks, snorkel gear, hammock, fishing rods, floating mats, beach games, TV/DVD in salon, etc. Safari is a 44-foot Lagoon catamaran with a crew of two, Steven & Erin. Safari is fully air conditioned and accommodates up to six guests in three cabins, each with queen berths and en-suite head. For family charters, 2 additional guests can either sleep in the salon or use the single cabins in each forepeak. The single forepeak cabins are accessible through their deck hatch and not via the interior. Safari has a 14-foot dinghy with 40HP motor, waterskis, tube, wakeboard, a one-person kayak, a two-person kayak, standup paddle board (SUP), floating mats, snorkel gear, underwater camera, TV/DVD in salon, iPod hookup, guitar, percussion instruments, Celestron GPS Star Scope, underwater fish light, geocaching kit, etc. 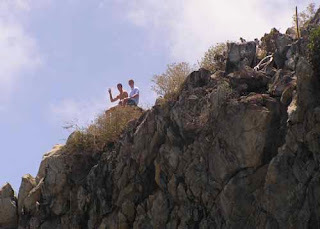 Steppin' Up is a 43-foot Leopard catamaran with an owner-operator crew of two, Bill & Michelle. Steppin' Up is fully air conditioned and accommodates up to 6 guests in 3 queen cabins, each with private ensuite head/shower. Steppin' Up has a 14-foot dinghy with 40HP motor, waterskis, tube, wakeboard, one-person kayak, one SUP/sit-on-top kayak combo, 2 stand-up paddleboards (SUPs), snorkel gear, fishing gear, TV/DVD, underwater video camera, internet access where available, etc. Victoria is a 56-foot Fountaine Pajot catamaran, owned and crewed by Wayne and Barbara (formerly owners of the motoryacht Flame). Victoria is fully air conditioned and accommodates up to 6 guests in three staterooms (Queens in the aft cabins & oversized double in forward cabin), each with ensuite head/shower. 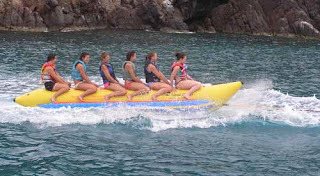 Victoria has a 15-foot dinghy with 70HP motor, waterskis, tube, kneeboard, standup paddleboard (SUP), 2-person kayak, floating mats, snorkle gear, underwater camera, beach games, 2 double beanbag chairs on foredeck, TV/DVD in salon and all guest cabins, onboard wifi when in range of US provider, etc. Blue Passion is a 58-foot Beneteau (Oceanis 58) sloop with an owner-operator crew of two. Blue Passion is fully air conditioned and accommodates up to 8 guests in 4 cabins, each with private, ensuite heads/showers. The aft, starboard guest cabin can be configured a double or split into twins (see layout diagram in the yacht's ebrochure). Blue Passion has a 15-foot dinghy with 50HP motor, waterskis for kids & adults, tube, 2-person kayak, snorkel gear, fishing equipment, you are welcome to watch DVDs on the boat's laptop, 112" projector TV, SkyScout Personal Planetarium, beach games, etc. Onboard wifi for internet. Greg is a dive master and Blue Passion includes 6 dives/week for certified divers. Bring your own gear, or equipment rental is $140 per week per diver and includes 2 tanks. Additional tank fills are $6 each. - NEW YEARS: OPEN beginning Dec 31 - Hold, but we can challenge! Drumbeat 1 is a 72-foot Irwin ketch. The crew is American. Vince Stracener is the captain and owner, his wife Linda is an excellent chef, and Kirk is the first mate. Drumbeat is air conditioned and accommodates up to 8 guests in four double cabins, all with ensuite heads/showers. Drumbeat has an 18-foot dinghy with 115 HP motor, waterskis, kneeboard, two kayaks, skurfer, tube, snorkel equipment, fishing gear, floating mats, hydroslide, hammock, DVD, satellite TV with 42" flat screen in salon, etc. Vince is a dive instructor and includes 5 dives/week to certified divers or a Resort course for non-certified divers. An additional cost of $25/dive/diver for more than 5 dives/week. Vince & Linda enjoy diving and do so even on their days off! - DIVING: 5 dives/wk included for certified & non-divers, gear included. $25/dive/diver for extra dives. 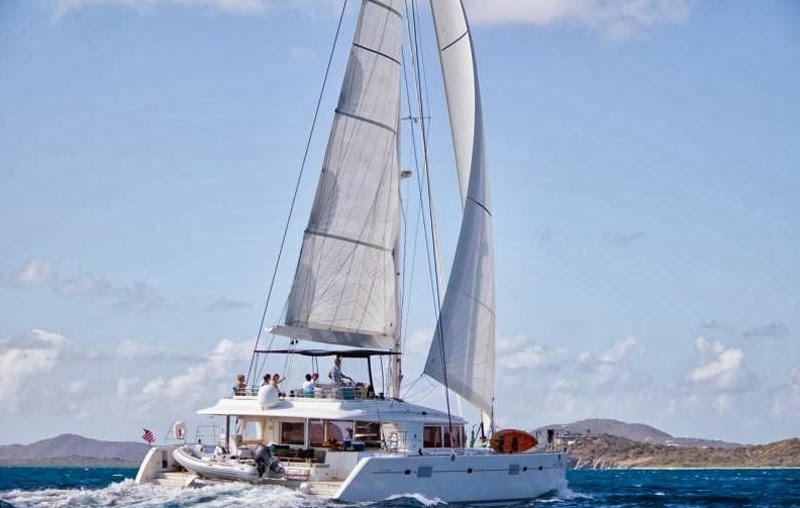 Feel the Magic is a 50-foot Voyage catamaran. Hank and Micheale are the crew aboard Feel the Magic. Feel the Magic is air conditioned and accommodates up to six guests in three equivalent cabins with queen sized berths and ensuite heads/showers. The middle queen cabin forward is available for family charters of 7 or 8 guests & this "extra" cabin would use the day head. Feel the Magic has a 15-foot dinghy with 70HP motor, waterskis, kneeboard, scurfer, wakeboard, tube, Hobie Mirage kayak that you can paddle or pedal, 2 standup paddle boards (SUPs), 2 surfboards, kiteboard, SeaDoo water scooter, snorkel equipment, fishing gear, floating mats, TV/DVD, hammock, kindle, onboard wifi, guitar, banjo, and other musical instruments, etc. Micheale won first place in the cooking competition at the 2012 Fall St Thomas Charter Yacht Show for her tuna stack. There's not many yachts available for New Years (some for Christmas week) so act now! We recently had a family of four aboard the charter yacht Zephyrus, a 50-foot Beneteau Oceanis, which is based in Key Largo, Florida. 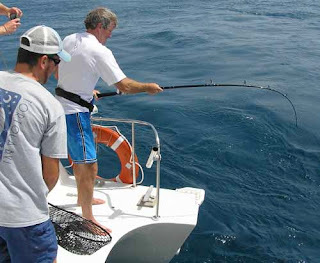 Zephyrus has very reasonable rates and will charter in the Florida Keys, and also out of Miami for SE Florida itineraries. Plus, they do the Bahamas, too. We have made new friends. Captain Tim was SO knowledgeable about the history of the area. The stories were wonderful; we learned a lot. We genuinely enjoyed both Captain Tim and Chelyn’s company. Chelyn has it down to a science. The food was perfectly prepared, presented and DELICIOUS! Thank goodness we snorkeled multiple times every day! We all felt very spoiled to have a Captain and a Chef. Absolutely, with respect to food, beverages, activities, all of the above. Both Captain Tim and Chelyn called in advance to clarify the input. Very responsive. This was a last minute request and it came together perfectly. Yes both before and after. We drove from NC. We stayed at both Aloft in Jacksonville and Elements in Miami – I would recommend both hotels. No, we made new friends, new memories. It was a great vacation and an excellent value. 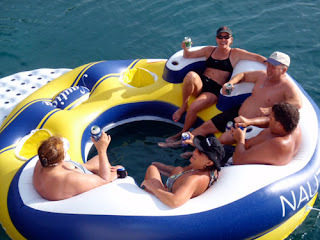 Thanks again for chartering with Paradise Connections and sharing your opinions with us. 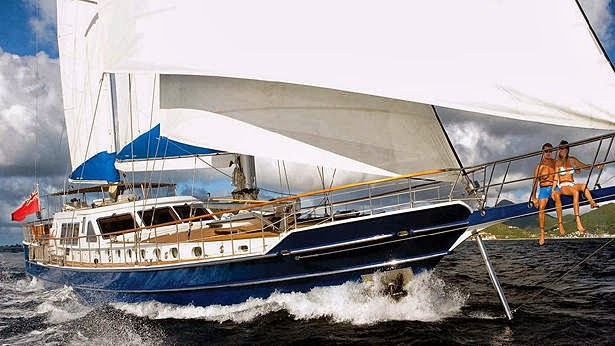 Zephyrus is a 50-foot Beneteau Oceanis sloop, owned and operated by Tim & Chelyn Shaw. The yacht is fully air conditioned and accommodates up to 6 guests in three cabins, each with Queen berths and ensuite head/shower. Zephyrus has a 12-foot skiff with 25HP motor, tube, wakeboard, snorkel equipment, floating mats, fishing gear, TV/DVD in salon, iPod dock, PlayStation3, hammock, etc. Zephyrus is a non-smoking yacht. 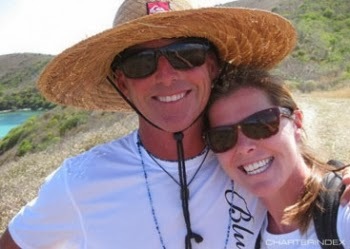 Tim & Chelyn are both dive instructors (they owned a dive shop in Key Largo) and offer one free dive/week (up to 5 divers) for certified divers or a resort course for non-certified divers for Florida Keys charters (NOT Bahamas). Dive gear to be rented. Valid for any new charter booked before December 14, 2013 and taking place before March 31, 2014. Only $6000/week for up to 6 guests for charters taking place in the Florida Keys or the Bahamas. This full-board rate does not include alcoholic beverages or applicable sales tax and cruising permits (see below). Not to be combined with any other offers.